To my Friends in the Dayton, Ohio area: I’m speaking there on May 2. 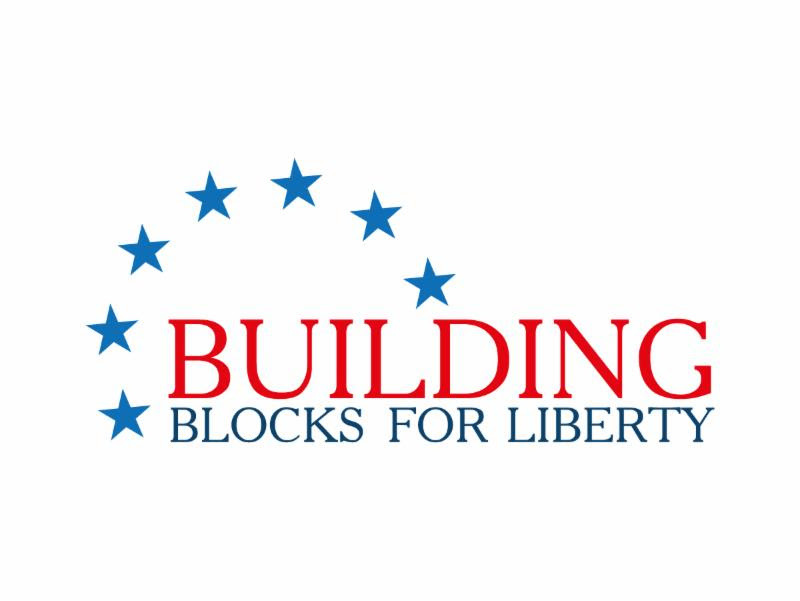 Now, listen up: I am an unaffiliated and unfunded little old lady who Michael Farris and Mark Mecker – with the seemingly endless stacks of cash available to the con-con lobby – do not want you to hear! They are so terrified of People hearing me speak that they have tried to get my events canceled or sabotaged. They have contacted hosts ranting and raving about how I shouldn’t be allowed to speak. Ask yourself: WHY do they NOT want you to hear what I say? Free speech is being wiped out in this Land – and it’s false friends and their minions who are doing it. 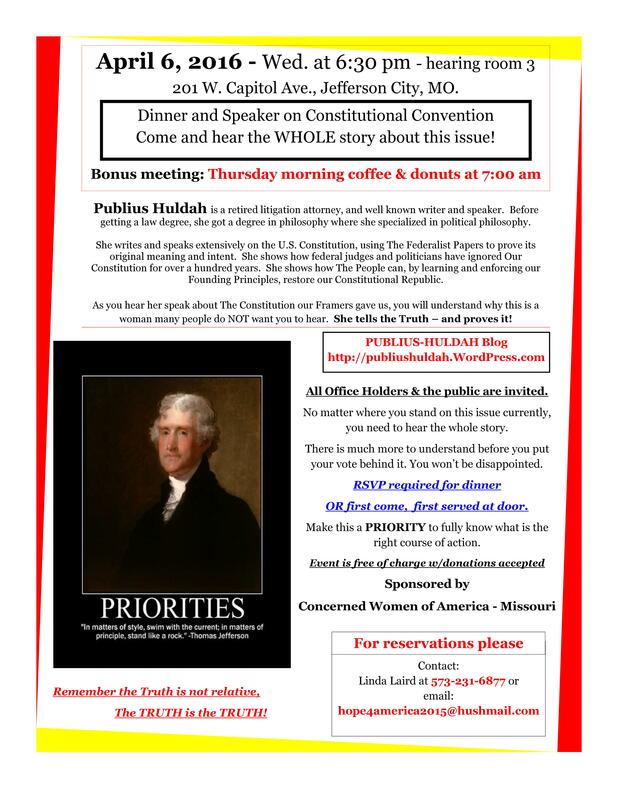 Event in Jefferson City, Missouri to speak on the con. Please come if you can! And tell your Friends and Relations in the area. Click on it and it will get bigger. 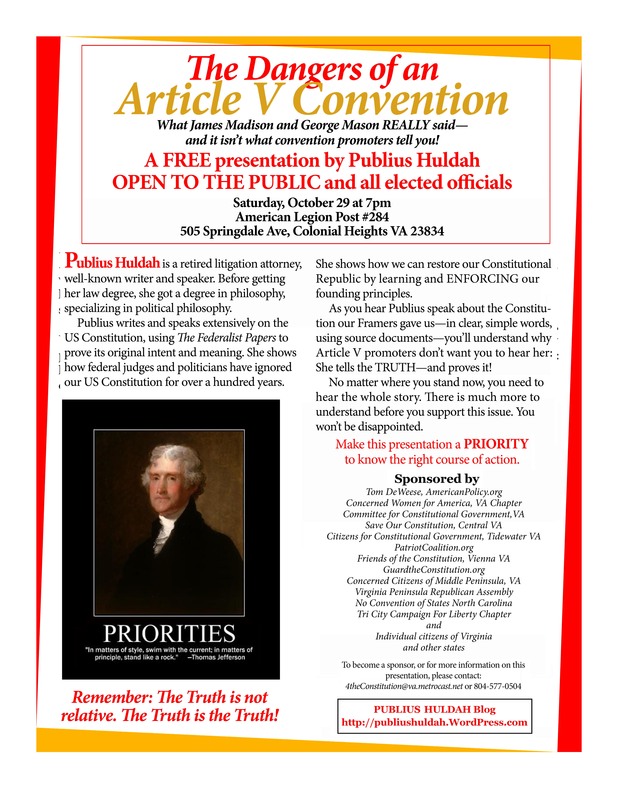 Publius Huldah is a Lawyer, philosopher & logician and a Strict constructionist of the U.S. Constitution. She is Passionate about The Federalist Papers (Alexander Hamilton, James Madison & John Jay), restoring constitutional government, The Bible, and the writings of Ayn Rand. 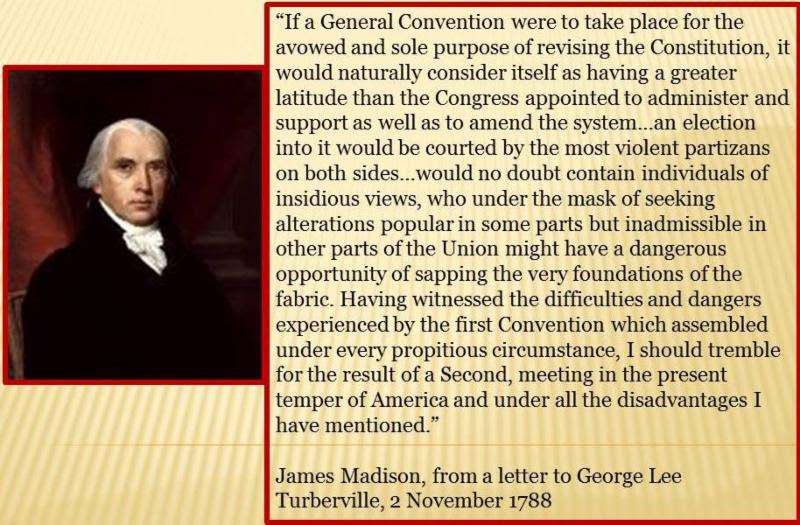 Publius Huldah has addressed State Legislatures on the subjects of Nullification, the 2nd Amendment, Constitutional Conventions and other issues related to liberty and the U.S. Constitution. 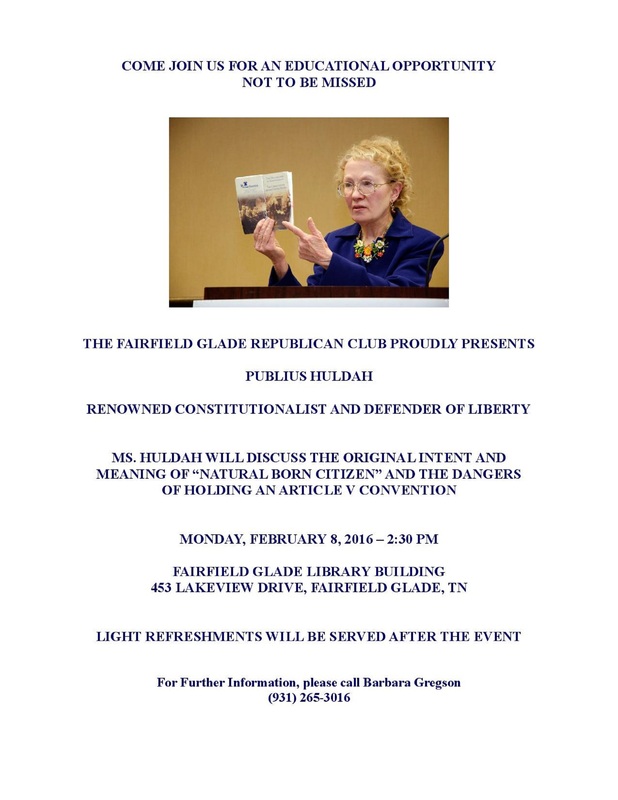 A video of Publius Huldah schooling the Tennessee Attorney General on the supremacy Clause in the U.S. Constitution is HERE. Join us Thursday night and prepare to be impressed! 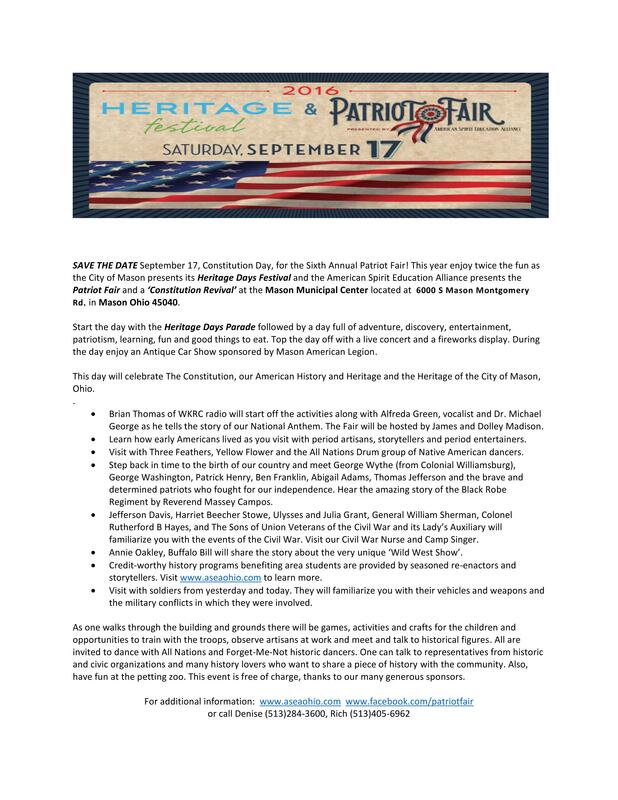 What a GREAT way to spend a Saturday if you live in the vicinity of Ft.. Wayne, Indiana! To my Friends in Tennessee: Do come! I would love to see you again or meet you. Location: The Schoolhouse, Building G, at the Ward Ag Center, 945 East Baddour Parkway, Lebanon, TN. 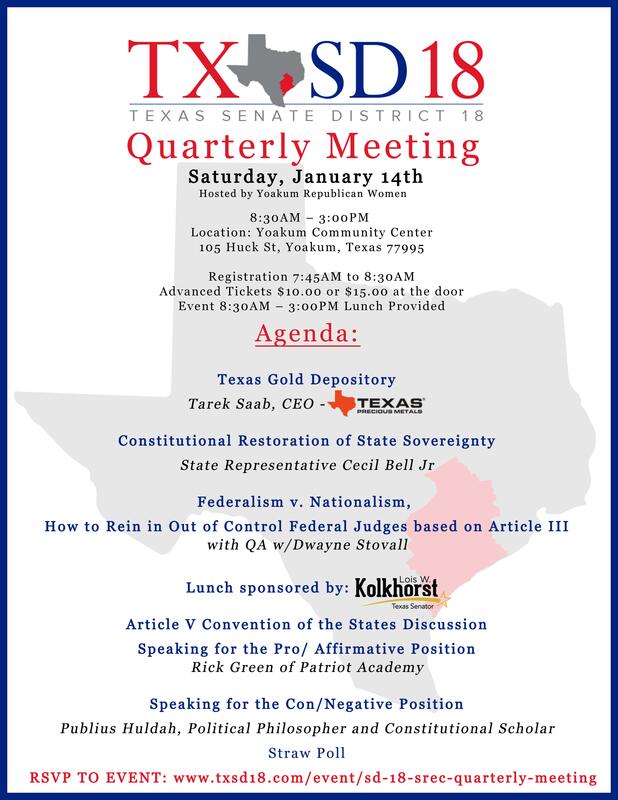 Come and see why COS doesn’t want you to hear me speak or read my papers!